Elizabeth Falk (née Moxley) was the wife of Lee Falk from 1977 until his death in 1999. Elizabeth is the daughter og Warren Luke and Elizabeth (née Beshears) Moxley. She grew up in Memphis in Tennessee. She graduated of Blytheville High School and starter her career as actress and singer in 1961. In the years 1970-86 she worked as Marketing Executive at BBDO Advertising. 1986-88 she was theatre producer at New York Town Hall; stage man, later producer at New York Vineyard Opera and co man New Artists' Coalition. From 1989, founder, producer and artistic dir for Pala Opera Assen; Fellow Accademica Rossiniana, Pesaro. When Lee Falk was hospitalized, Elizabeth helped him write the end of his last two Phantom stories: "Terror at the Opera" and "The Kidnappers". 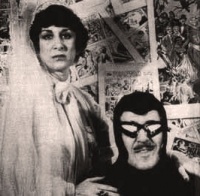 1975 Mandrake the Magician: Sunday "Ghost Town" as Moxley U. This page was last edited on 13 March 2019, at 20:53.